The liberal campaign against the NRA has successfully pressured some companies to sever their partnerships with the gun rights group but it’s having another, unintended effect: galvanizing conservatives who feel the NRA has been unfairly attacked. 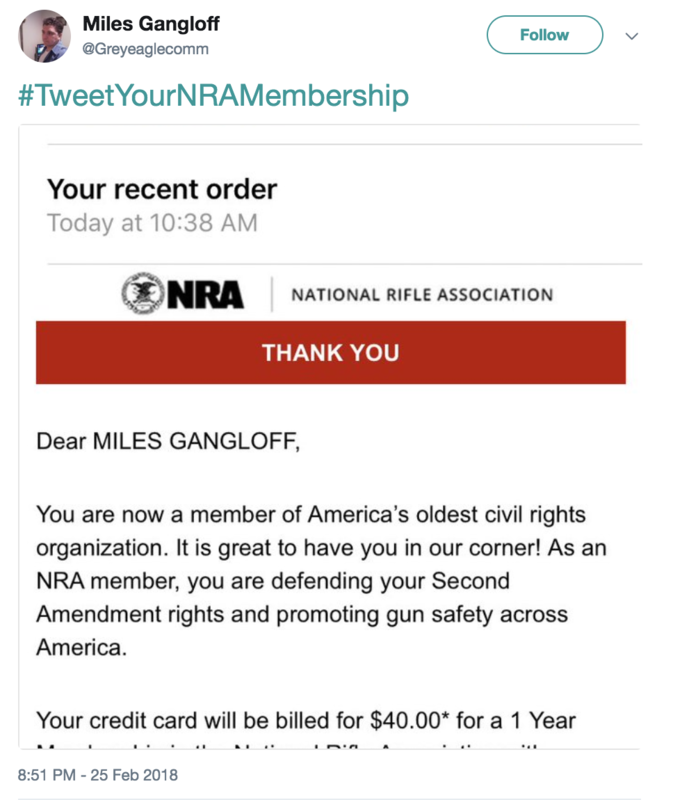 Liberal activist groups turned the NRA into a scapegoat for the Florida school shooting that left 17 people dead and immediately launched a pressure campaign meant to weaken the NRA, which touts itself as the nation’s longest-standing civil rights organization. 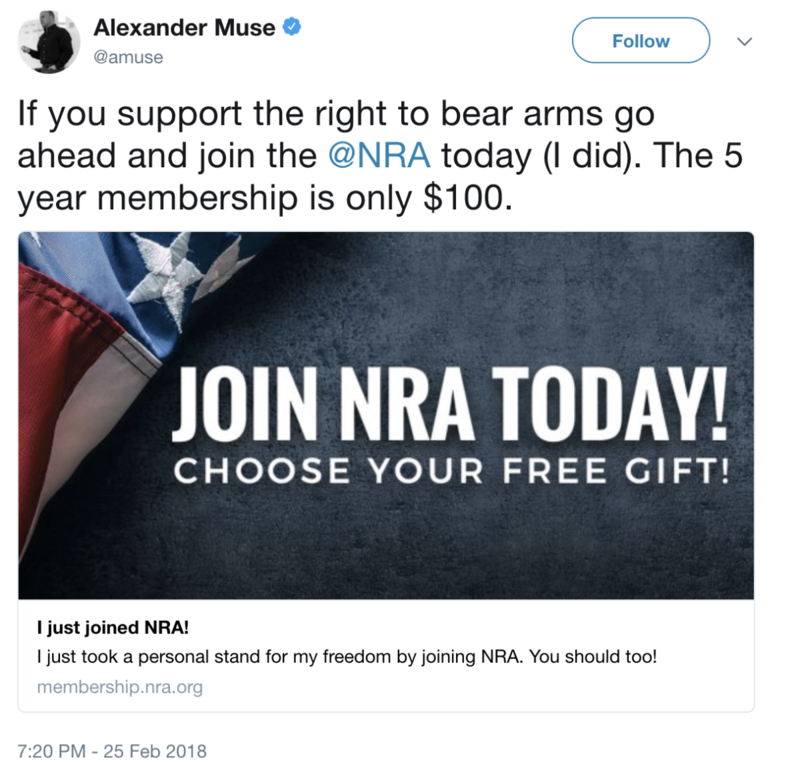 Liberals have threatened boycott campaigns against companies like FedEx, for having discount partnerships with NRA members. 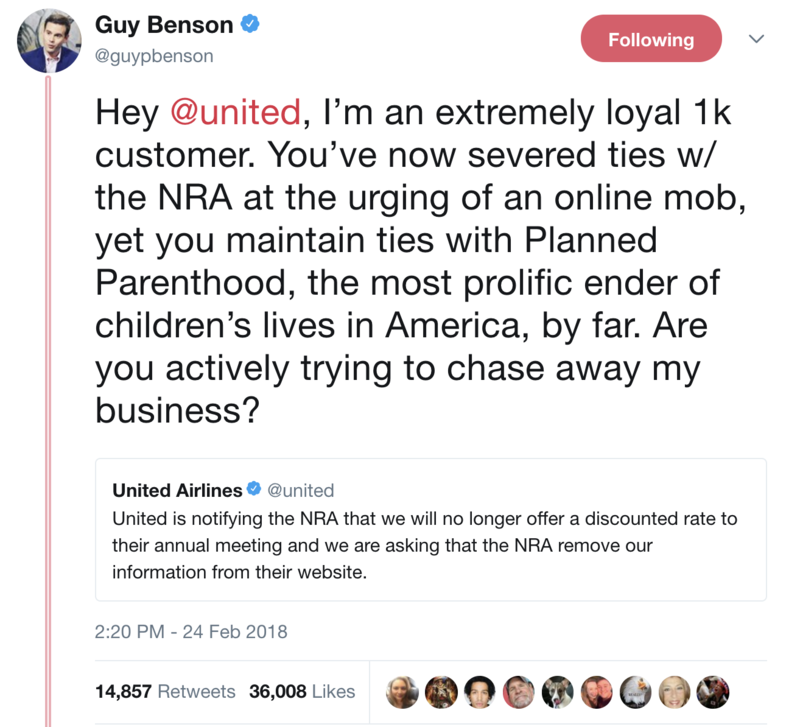 On that front, the activists have had some success, as several companies including United Airlines and Delta Airlines caved to the pressure and severed their ties with the NRA. Left-wing website ThinkProgress, a project of the George Soros-funded Center for American Progress, has since taken credit for launching that boycott campaign. Two left-wing gun control groups, Moms Demand Action for Gun Sense and Everytown for Gun Safety, are pressuring Amazon, Apple and Google to ban the NRA’s channel from their streaming platforms. So far, their censorship campaign has been unsuccessful. 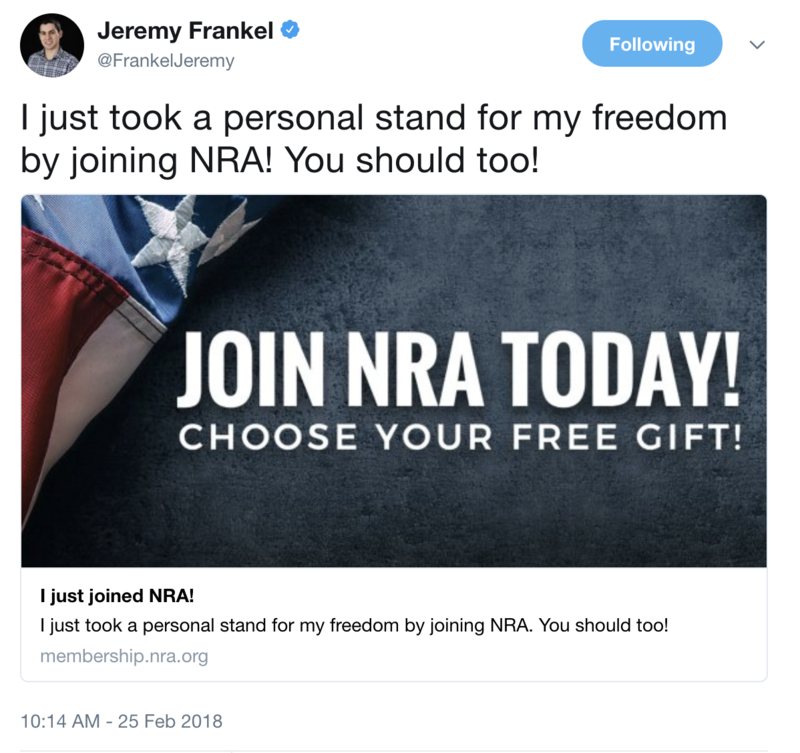 As liberals and prominent media figures have stepped up their attacks on the NRA, many on the Right are rushing to the NRA’s defense. 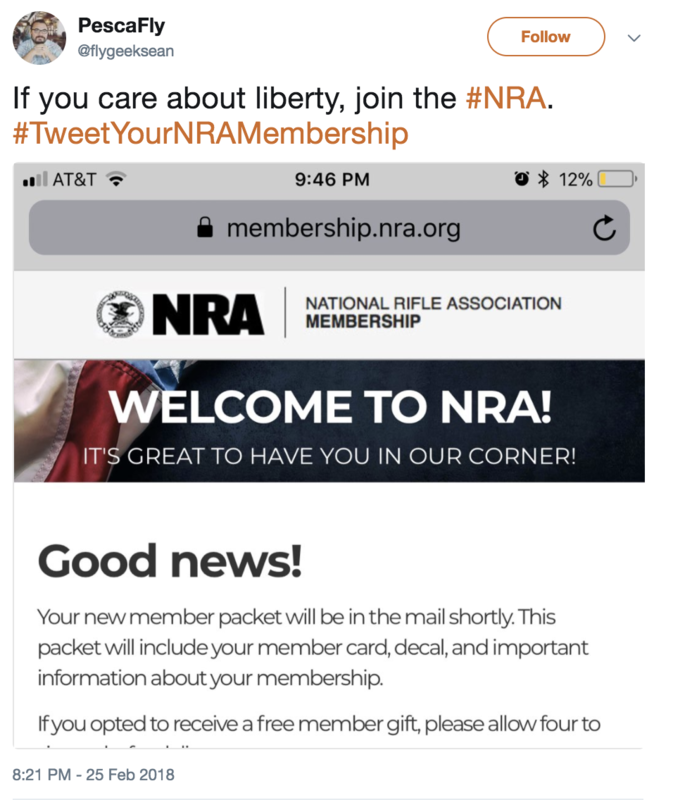 Social media was flooded over the weekend with conservatives announcing they had joined the NRA as an act of defiance. 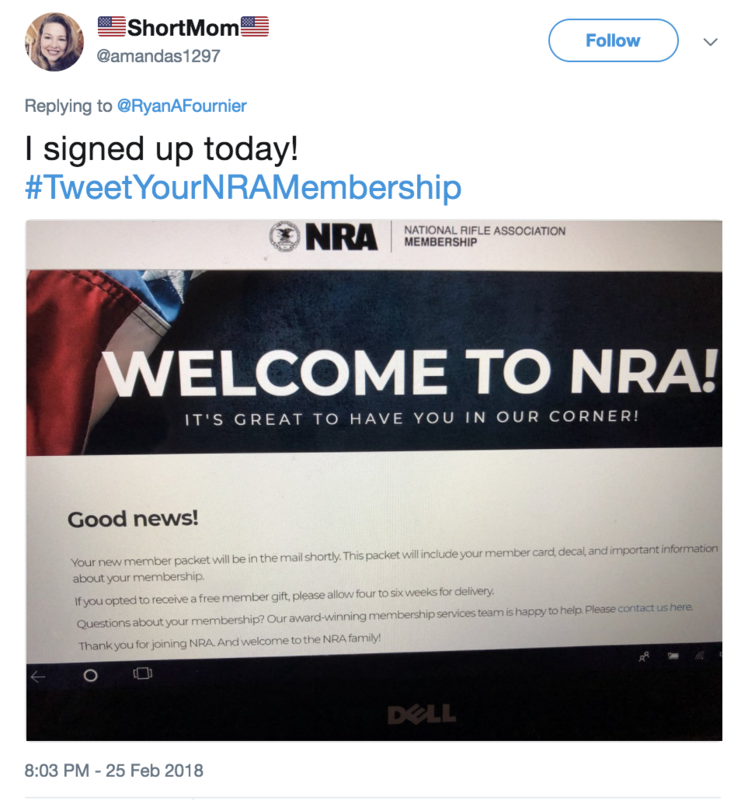 Many conservatives posted pictures under the hashtag #TweetYourNRAMembership, providing proof of their new membership. Companies that boycott the NRA also face the prospect of retaliatory boycotts — a technique some on the Right have used in the past to beat back corporate boycotts of conservatives. Republican legislators in Georgia on Monday blocked a massive tax carve out for Delta Airlines. Georgia Lt. Gov. Casey Cagle vowed on Monday to block any legislation granting Delta a tax cut in retaliation for their boycott of the NRA. 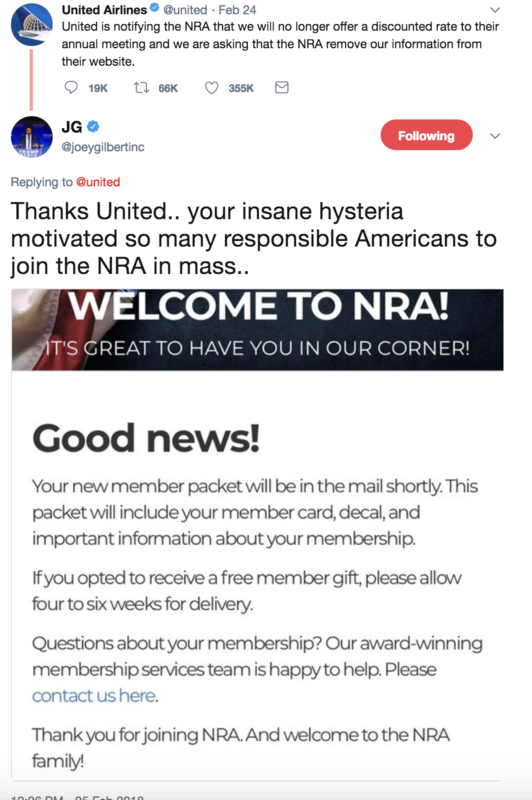 The NRA hit back at the companies boycotting them in a statement released over the weekend. Radio host Mark Levin on Saturday called for a counter-boycott of any companies that boycott the NRA. Levin’s tweet went viral and had been shared more than 10,000 times by Sunday evening. Republican National Committeeman Shawn Steel on Sunday night specifically called out United and Delta for a boycott. “Why support corporations who hate you?” he asked. Counter-boycotts have proven effective for conservatives in the past. Coffeemaker company Keurig announced in November that the company would be pulling ads from “Hannity” in response to a pressure campaign led by left-wing group Media Matters. Hannity’s supporters immediately turned on the company and announced they would boycott Keurig as long as Keurig boycotted Hannity. The company’s CEO apologized to employees for the negative effect the boycott had. Insurance company USAA saw a similar, intense backlash when the company caved to liberal pressure last May and pulled its ads from Hannity’s show. After pressure from conservatives, the company announced it would be pulling ads from liberal shows like MSNBC’s “Maddow,” before later reversing course and ditching the boycott approach altogether.